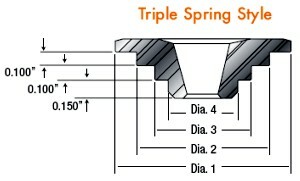 New valve springs with larger diameters require new retainers to handle the higher pressures developed by the springs. COMP Cams steel retainers are the solution. Comps steel retainers are precision machined from 4140 chromemoly and finished in black oxide. These precision retainers are specifically designed for positive location when combined with COMP Cams high-quality valve springs. 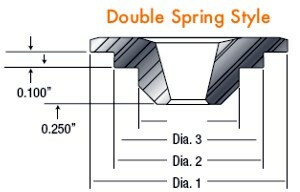 For superior strength and ultimate stability Comp offers their 10° retainers and 10° valve locks. Comp Cams Super Lock® Steel Retainers for the AMC V8,SB Chevy,SB Chrysler,SB Ford,Ford 302 H.O. & 351W, Olds V8 and Pont V8 with 10 degree Lock Angle. Comp Cams Super Lock® Steel Retainers for BB Chevy, BB Chrysler, Ford 351C, 351M, 400, 429 and 460 10° Lock Angle. Comp Cams Steel Retainers for SB Chevrolet 283-400, Chevrolet V6 and Buick V-6. 7° Lock Angle. 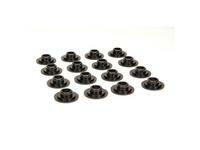 Comp Cams Steel Retainers for Big Block Chevy, Chrysler and Big Block Fords. 7° Lock Angle. Comp Cams Super Lock® Steel Retainers for SB Chrysler, SB Ford, Ford 351C, 351M, 400, 352, 360, 390, 427, 428, 429, 460, 302 H.O. and 351W engines. 10° Lock Angle. Comp Cams Super Lock® Steel Retainers for Big Block Chevy and Big Block Chrysler. 10°Lock Angle. Comp Cams Titanium Retainers for GM Gen III with 26915-16 or 26918-16 Comp Valve Springs. 7°Lock Angle. 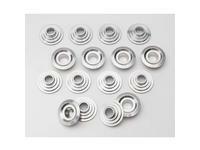 Comp Cams Steel Retainers for GM Gen III with 26915-16 or 26918-16 Comp Valve Springs. 7° Lock Angle.